Cut your card stock to fall within the post office guidelines (see tip above). On one side, use a ruler or straight edge to draw a line vertically down the center of the card. Write your message on the left, and your return address and the address you are mailing to on the right. If you are using a dark colored card stock, like our blue card, You can trim large address labels down to fit on the left and right sides so that your message and addresses are easier to read. To decorate, choose the foam stamps you want to use and add a light coat of paint to the stamp. Firmly but gently, you don’t want your stamp to slide out from under your hand, press the painted stamp onto the card stock. Remove the stamp by lifting straight upward. Use a marker to write “New from Camp” on the front of the postcard. Allow the paint to dry completely before mailing. Don’t forget the stamp! 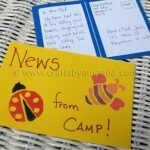 This project for News from Camp Postcards was printed from CraftsbyAmanda.com - https://craftsbyamanda.com/news-from-camp-postcards/ and can only be printed for education or personal use.